American DJ LED UV GO DJParts - All Variety of Parts that DJ Needs. 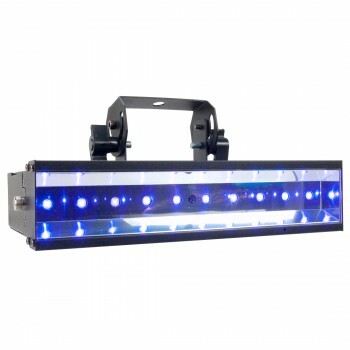 Specifications: - Rechargeable Lithium battery powered, indoor Ultraviolet Bar with 10x 1-Watt UV LEDs - Great for performance stages, theatrical productions and special effects installations – requires almost no maintenance – long life LED, low heat output, low power consumption & no moving parts - Long Life LEDs (50,000 hrs.) - Strobe effect - Electronic Dimming: 0 - 100% - Beam angle: 10 degrees vertical x 40 degrees horizontal linear beam angle – great for wall washing - 4-button LED display on rear panel (Non-DMX) - Power Draw: 53W - Battery On/Off switch on rear panel - Includes safety hook - Includes IR Wireless Remote - Battery life indicator - Rechargeable Lithium battery life: 8 hours full on (with a full charge); 6 hours charge time - Multi-voltage Operation: AC 100-240V, 50/60Hz - Run in AC or DC power - Dimensions (LxWxH): 317x172x136mm - Weight: 2.5 kg Specifications subject to change without notice.